The Water Resources Action Project is pleased to unveil its revamped website featuring updated news, information on its ongoing projects, images, biographies of our newest board and team members, a comprehensive introduction to the basics of rain harvesting system technologies, and many other additions and improvements. On the “How it Works” page, users can now find a detailed PowerPoint presentation on rainwater harvesting technologies including rain barrels and cistern systems, describing why they are practical, their components, the catchment and conveyance system, and a cost benefit breakdown for each. Picture galleries have also been added to the page illustrating each type of system. The “Projects” page now provides a convenient and detailed table of WRAP’s current efforts. Graphs of water collection volume have also been added for the projects where data is available. 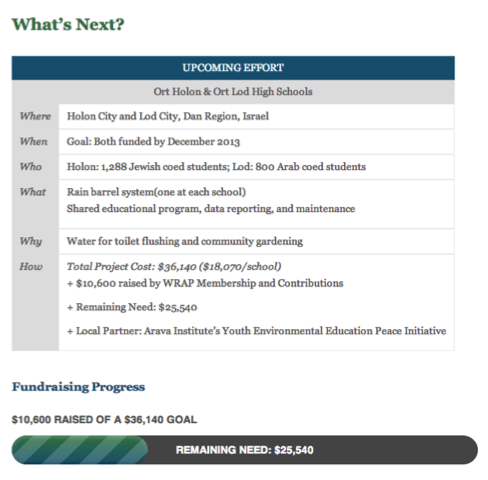 The website’s “What’s Next?” page further details WRAP’s upcoming effort for which the group is currently raising funds: a dual school installation and paired environmental curriculum at Ort Holon and Ort Lod High Schools in Israel’s Dan Region. Ort Holon is a coed Jewish school with 1,288 students in Holon City, and Ort Lod is a coed Arab school with 800 students. 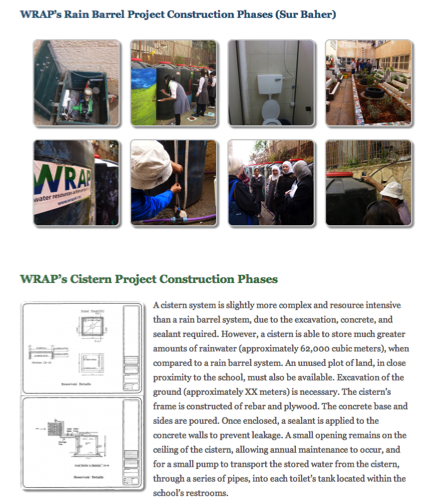 Installing rain barrel systems at each school and engaging the students in a shared environmental curriculum with regular communication and visits between the schools would encourage dialogue as well as provide the schools with adequate water supplies for toilet flushing and community gardening. WRAP plans to partner with Arava Institute’s Youth Environmental Education Program Initiative who will implement the educational component for this upcoming effort. The website now provides convenient links to our newly created Facebook page (www.facebook.com/wrapdc) and Twitter feed (www.twitter.com/WRAP_DC) where you can keep up to date with WRAP’s most recent news. See all the latest updates at www.wrapdc.org.